Here is the List Of Best Free IFC Viewer Software for Windows. These software can open IFC files and other 3D CAD files as well. All of these software are feature rich and let you view IFC files using numerous viewing tools and viewing modes. 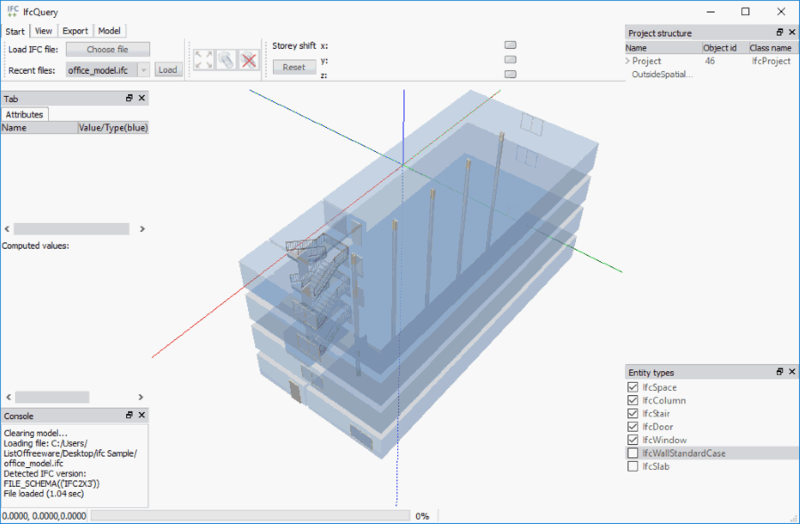 You can view 3D models with no or partial transparency, selectively hide or view components, view wireframe of models, view component details, and do much more with these IFC file viewer software. Some of the features are common among these IFC viewer freeware, while some features are exclusively available. Standard tools include Zoom, Rotate, Pan, Wireframe, Perspective control, Markup, etc. Some of the exclusive tools found in some of these IFC viewers are: Storey mode (slide storeys of a model freely across x,y, and z axes), Lighting option (manually set Sun’s position), and Game Mode (walk in/around a model like you would in a game). These software also let you selectively hide/view components, and view component details. You can also view component list as component trees with these free IFC viewer software. The following list contains detailed review about each mentioned software to open IFC files; you will also know how to open IFC files using these software. I like BIM Vision and Areddo the most. BIM Vision in an exclusive IFC file viewer and share pretty interesting IFC viewing tools with Areddo, one of which is Storey Slide mode. I also liked Sobiri Model Viewer because of its Game mode, which lets you walk in/around a model, as if you are playing a game. You can also checkout the list of best free DGN Viewer Software, IGS Viewer Software, STEP File Viewer Software. 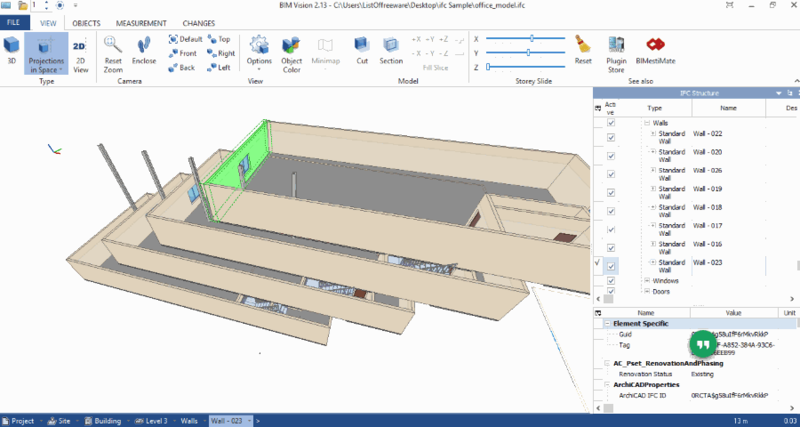 BIM Vision is an exclusive IFC file viewer software. 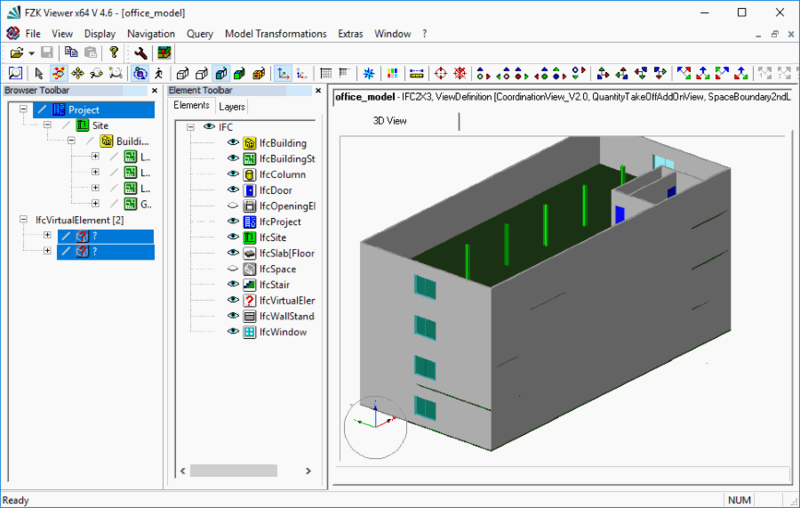 An IFC model can be viewed in 2D as well as 3D perspectives. Its a very interesting IFC viewer, as it provides viewing options that are not generally found in a standard IFC viewer software. You can set transparency of objects and elements as full, partial, or none; this lets you view the outer portion as well as inner portion of a 3D model. An option to set lighting as none, standard, or metallic is also available. The most interesting tool lets you move/slide the storeys of a model freely along X, Y, or Z axes. Elements of an object can be selected layer wise or object wise. You can measure volume, area, curve surface, and weight of objects with this free IFC viewer. Standard viewing tools like Zoom, Rotate, and Pan are available, which let you view a model freely. All the elements of 3D models are listed in a panel on the interface, and can be hidden separately. 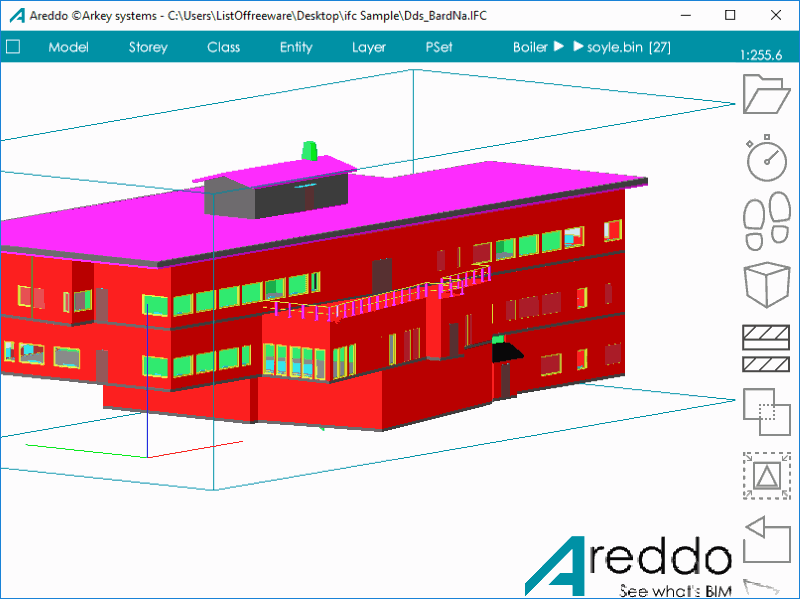 Areddo is a lightweight IFC viewer for Windows, where you can open multiple CAD files at a time. It lets you open IFC files and have a detailed view at them. You can view IFC models based on Storey, Entity, or Layer. 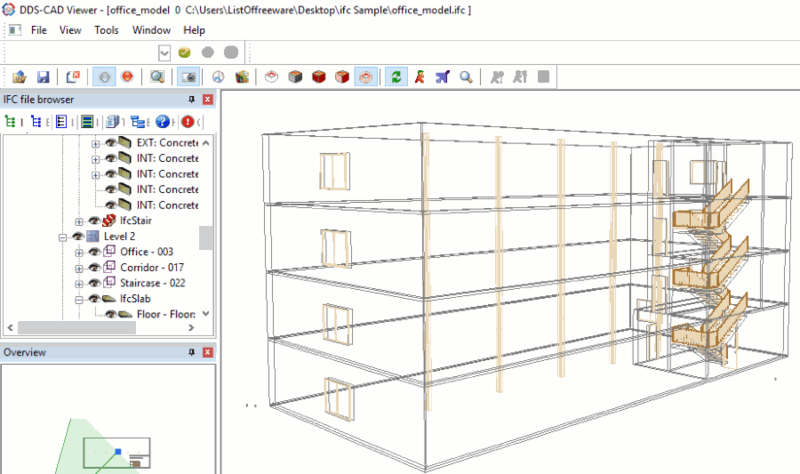 Storey mode displays story blocks of a model; storeys of a model can be hidden/viewed separately. Entity tool lets you hide/view elements of a model selectively. Various layers of a model can be viewed or hidden at once in Layer Mode, such as: Columns, Floors, Walls, and Zones. The lighting option lets you adjust Sun’s position manually to render light and reflection for a 3D model. Carry out annotation, and measure distance, area, or volume. Here you can select a component to view its complete information. A model can be rotated and moved freely. On Areddo, you can view IFC, PTS, and ADL files. Solibri Model Viewer is a free CAD viewer and provides options to open IFC files and view them. It has various viewing modes, such as: Pan, Spin (around a point), Walk, and Game. Out of the four viewing modes, the Game mode is one of the best features that I have come across amongst these listed IFC viewers. It lets you view and walk around and inside a 3D model like you would while playing a First Person game. Use your mouse to look around from a point and use the WASD keys or Navigation Keys to move in and around a model. 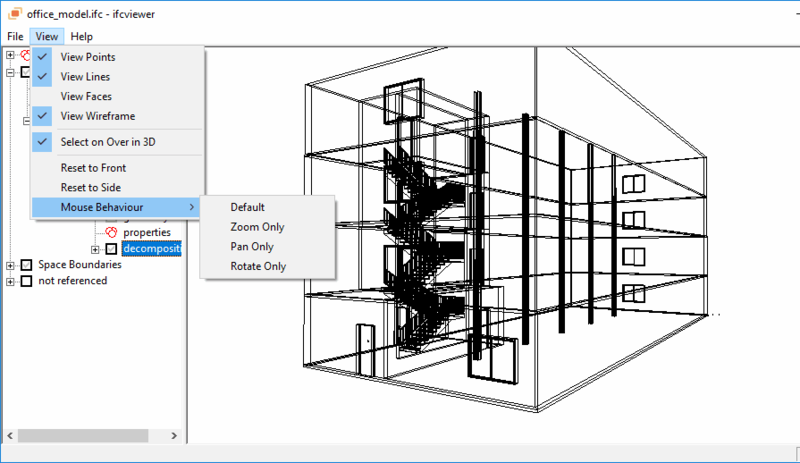 You can view a model in solid form, make the whole model transparent, or view only selected components. The Scroll key of mouse works as standard Zoom key. Measurement tool lets you measure dimensions of the selected components. You can hide or make a selection transparent. Markup tools let you draw in freehand or add text in desired color. Clicking on an object displays respective details on the screen. A panel on the left side of the screen displays component tree in various hierarchical formats. These are: Containment Hierarchy, Component Hierarchy, Layer Hierarchy, and Federated floors. Note: This software to view IFC files cannot run on systems with less than 4GB RAM and Graphics Card with OpenGL version lower than 3.3 (preferably NVidia or AMD). Checkout the website for more minimum system specifications required. IfcQuery is another IFC viewer with selective Storey viewing option. You can select and slide a storey along x, y, and z axes using the Storey Shift tool. Transparent viewing option, along with Zoom and Rotate options are available. You can also view Wireframe structure of a 3D model. Selected components can be hidden if required. A tree of components is available, where components are classified category wise. You can adjust the transparency of components selectively. One thing that I liked about this IFC viewer is that you can select different components and export them in IFC format. Tekla BIMsight is a free CAD software, which you can use to open IFC files to view them. Zoom and Dynamic Zoom options are available, which you can use to view IFC models while rotating them freely along any axis. This software lets you control what elements of a 3D model you want to view or hide. A panel is available from where you can hide/unhide objects, and you can also change color of objects if you want to. Markup tools are available, using which you can either make freehand drawing or add notes to IFC files. Along with IFC, you can open and view tbp, ifczip, dgn, dwg, iges, igs, skp, stp, step, xml, and xmlzip files here. DDS-CAD Viewer is a free 3D CAD file viewer where you can open IFC files. It is one of the most convenient IFC file viewers and offers a set of tools to view IFC files thoroughly. While viewing a 3D IFC file, you can render hidden lines, view wireframe, render shaded portions, view model in walk mode/fly mode/elevator mode, etc. 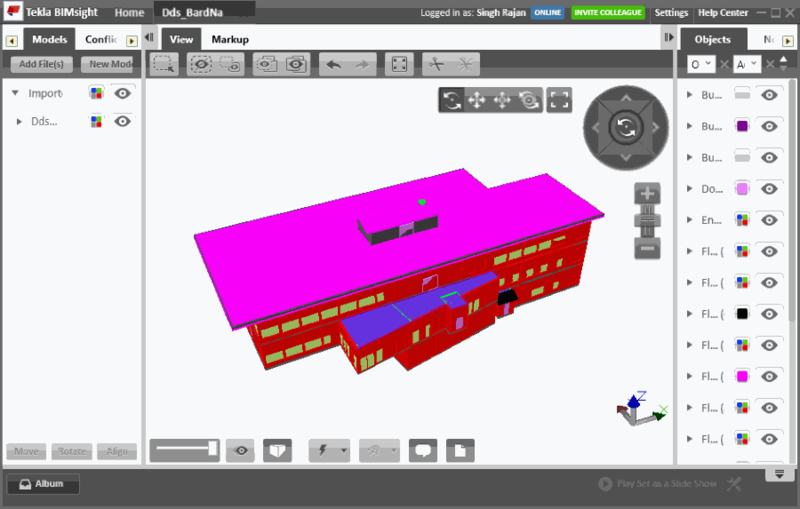 This IFC viewer lets you view 3D models in various projections: top, left, right, bottom, front, rear, and isometric. You can also view models in 2D or 3D perspective. Zoom in, zoom out, pan object, rotate object freely, and change background color as per your convenience. A panel is available on the left side of the interface which displays all the objects of 3D model. These objects can be hidden selectively, and their properties can be viewed from here. You can also view the dimensions of the model and different objects that are used to make a model. Open dwg, dxf, gbXML, cfi, and vec files here, along with ifc. IFC files can be exported as CAD files in dwg, dxf, cfi, dwf, or 3ds formats, or as images in jpg, bmp, or png formats. 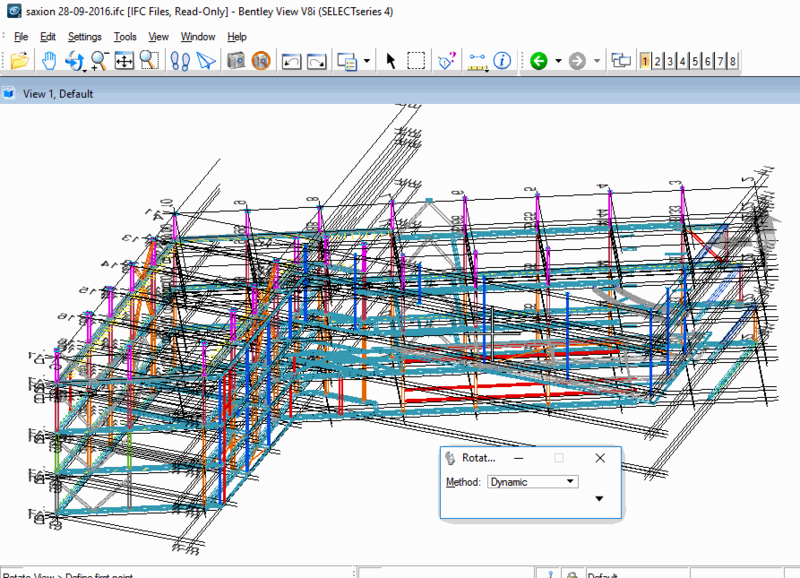 Bently View is a dedicated CAD viewer tool, which lets you view IFC files for free. Standard viewing tools let you Rotate, Pan, and Zoom IFC models. A 3D model can be rotated in dynamic mode or 2 point mode. You can view the boundaries of a model, view as grid, select the line style, set markers on model, and change background color. Walk by or Fly by viewing modes can be activated to view models properly. Measurement tool is available, which lets you measure distance as well as angle. Along with IFC files, you an view dgn, dxg, dwg, cel, dgnlib, 3ds, mif, tab, skp, tiff, bmp, jpg, png, pdf, and obj files here. IFC Viewer is another exclusive IFC file viewer. It is a simple tool with basic options to view 3D IFC models. The model opens on the interface along with its info and list of its components. Option to hide or view components is available. Freely rotate a model, zoom, and move on the canvas of this free IFC viewer. You can view the lines, points, faces, and wireframe of a model pretty easily. It is a simple IFC viewer tool and is very lightweight. FZKViewer is a free IFC viewer available on the website of Karlsruhe Institute of Technology for free. You can open ifc, ifcXml, and ifczip files here, along with gml and xml. You can view 3D model in wireframe mode, solid mode, view hidden lines, view back-surface, view grid, change background color, etc. Isometric projections, along with front, rear, top, bottom, left, and right projection can be viewed for a 3 dimensional CAD model. Zoom, Pan, Rotate, and other basic 3D viewing tools are available as standard. A panel on the left of the UI displays all the details about IFC model and also displays all the elements of a model. These elements can be hidden or displayed as required. A Query module is available with this IFC viewer software, which lets you run query for Model info, Entity User info, Element Info, Quantities, Statistics, Message Log, etc.